The big differences between teaching adult dogs and puppy classes. Controlling the dog’s energy and enthusiasm—putting problems on cue. The essential things to teach -- what the owners want Test-Train - Test, how to monitor improvement and produce reliable results. Ruthless objective quantification of performance - games for objective assessment of speed, reliability, and precision. The ultimate challenge - The Sit Test. 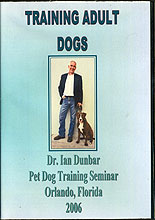 Veterinarian, animal behaviorist, and dog trainer, Dr. Ian Dunbar received his veterinary degree and a Special Honors degree in Physiology & Biochemistry from the Royal Veterinary College (London University) plus a doctorate in animal behavior from the Psychology Department at UC Berkeley, where he researched the development of social hierarchies and aggression in domestic dogs. He has authored numerous books and DVDs about puppy/dog behavior and training, including AFTER You Get Your Puppy, How To Teach A New Dog Old Tricks and the SIRIUS® Puppy Training video. In 1982, Dr. Dunbar designed and taught the world's very first off-leash puppy socialization and training classes -- SIRIUS® Puppy Training. Subsequently, he created and developed the San Francisco SPCA's Animal Behavior Department, the American Kennel Club's Gazette "Behavior" column, which he wrote for seven years, and the K9 GAMES®, which were first held in San Francisco in 1993 and continue as annual events in Japan and France. He hosted the popular UK television series Dogs With Dunbar for five seasons and has appeared on numerous radio and television programs, including the Today Show (US) and Dash Village (Japan).